Hi friends. I figured it was time to share my go-to roll recipe with you, since it shows up so often in my menu plan posts. It's been a long time since I've been to Texas Roadhouse, so I don't know exactly how close these come to their rolls, but I do know that they are pretty darn delicious. 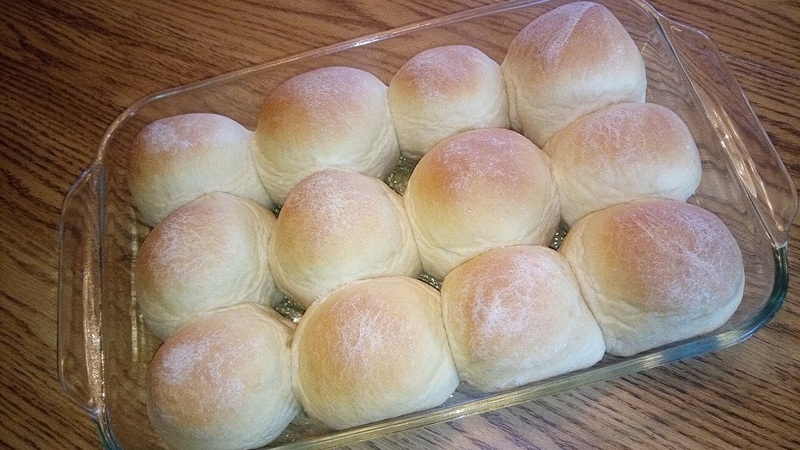 We use these as hamburger buns, and also serve them anytime a meal calls for rolls. I've made them smaller to use as slider buns, and I've made them oblong to use for hot dogs or subs. It does require a bit more effort to make these than it does to just buy buns or rolls, but that effort is more than worthwhile. Set bread machine to the dough cycle and start. Don't forget to check back after about 5 minutes to make sure everything's mixing correctly. Scrape down the sides, and add water if the dough is too dry, or flour if the dough is too wet. When the dough cycle is complete, punch down and turn out dough onto a floured surface. Cut into 12 even-sized pieces. Let rest for 10 minutes. When the resting period is done, shape into rolls and arrange in a greased 9x13" pan. Cover loosely with a towel and let rise until double. The length of time will depend on the temperature of your kitchen, but I generally let them rise for 30-60 minutes. Bake in preheated 350°F oven for 15-20 minutes, or until golden brown. Baste with melted butter, if desired (I never do). For the authentic Texas Roadhouse experience, serve with Cinnamon Honey Butter. Mix together 1/2 c. softened butter, 1/4 c. powdered sugar, 1/4 c. honey, and 1 t. cinnamon.